These little birds make a nice meal. 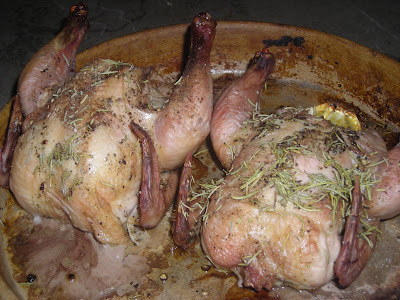 Roasted, as you would a chicken with lemon and garlic and herbs inside. A rub of olive oil and a sprinkle of salt and pepper and in this case more rosemary. Instead of herbs inside, you can stuff them with a wild rice stuffing (I use my wild rice casserole and just put it inside the bird) or a regular bread stuffing as you would do to the Thanksgiving bird. 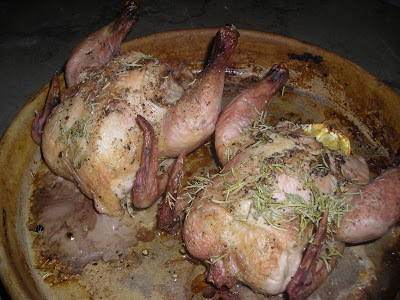 Although they're called Cornish game hens, these little birds have never seen Cornwall. Not an old breed either, but rather one developed by Tyson to be a single serving bird of mostly white meat in the mid 1900's! They do make an elegant dinner and I do love their single serving size. I have been looking for a way to make these. I am glad I found this post. I will try it this way. Thank you! those look very odd in color....are they cooked?